Kerris, could not be more Cornish, he was born and raised in the Duchy, and has remained there throughout his working life. He won a scholarship to Penzance School of art at the age of 14, where he studied a wide range of subjects including pottery under Michael leach, son of the celebrated Bernard Leach of St. Ives. After two years, he had to decide whether to become a potter or to become involved in the world of commercial art and design, luckily for us he chose the latter, in time he established himself as a master sign writer, from which he ran a very well known and successful business, save for two years, when he served as a nurse in the R.A.F. Whatever his main task, Kerris continued to paint whenever time allowed and demanded for his work rapidly grew. 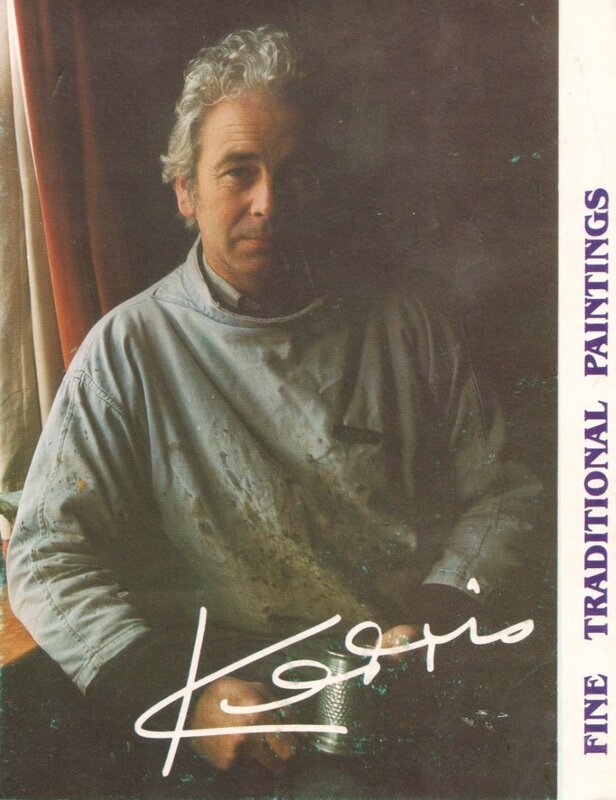 In 1970 he decided to give up the sign writing business and became a professional artist, often holding exhibitions of his work in and around the village of Polkerris where he lived and from which he has taken his professional name “Kerris”. Kerris paintings can now be found throughout the united kingdom and as far afield as Australia, New Zealand, Hong Kong, South America and the USA. He often takes working holidays and has enjoyed painting beautiful landscapes in Spain, France, Cyprus, India, Kenya, The Seychelles, Thailand, Maldives and the Atlas mountains in Morocco, he has also been seen taking narrow boat holidays in the UK where he has taken the opportunity to paint some of the picturesque inland waterways Britain has to offer. Kerris admires the work of the old masters, Constable and turner, he is quietly proud when visitors to his exhibitions have been heard to refer to him as the “Cornish Constable”. Through his traditional style, his work reflects the tranquillity and peaceful rivers and canals, the beauty of remote moorlands and the calmness of quiet harbours and tidal estuaries. His paintings are all embraced by an air of exquisite timelessness. He can still today be found at his studio, in the village of Tywardreath Cornwall. Why not visit him at his studio in Tywardreath, perhaps commission an an original of your special Cornish place?? or purchase one of the many originals or prints he has to offer of the beautiful Cornish coast line. Kerris also runs his own art classes, on a Wednesday morning and Saturday morning throughout the year, all painting abilities are welcome, for further details please contact us, via the contact page.